The Northern Gateway Panda Pipeline Project Must be Stopped! The big news for many was that China will rent two Panda Bears to Canada for 10 years at a cost of 1 million dollars per year. China gets oil, Canada gets Pandas – and an oil spill to clean up. Has to be a Panda Pipeline! What is the BC North Coast worth? Kermode Bears are worth more, much more. The Enbridge Northern Gateway Pipeline will deliver crude oil from the Tarsands of Alberta to the Port of Kitamat on the North coast of British Columbia where it will be loaded on to Mega-Tankers, 3X the size of the infamous Exxon Valdes carrying up to 10X the amount of crude, then transported through the most treacherous channels and passages on the North Coast. This area has the highest number of shipping incidents in all of the North American Coast line. An area which is abundantly rich in marine life and shore life dependent on a clean environment. This is the area dubbed The Great Bear Rain Forest. Home of the world famous one of a kind, iconic Spirit Bear. Info on Saving Kermode Bears The proposed tanker routes run through or are directly beside; Dewdney Glide Islands Ecological Preserve, Moore McKenny Ecological Preserve, Union Passage Marine Provincial Park. Other Ecologically sensitive areas within 50 kilometers of the tanker routes include: Naikoon Park, Lowe Inlet Marine Park, Klewnuget Marine Park and 50 or more fish bearing streams, 12 or more clam and oyster beds, and several herring spawn areas. All these could be gone forever when (not if – when) a spill occurs. A moratorium on allowing crude oil tankers has been in place for 37 years. The federal government announced a moratorium on offshore drilling and on crude-oil tanker traffic passing through Dixon Entrance, Hecate Strait, and Queen Charlotte Sound, (Hansard 1972) approved by the Social Credit government of BC in 1989. Both Stephen Harper and Chisty Clark deny it ever existed. This is another example of Panda Politics. Prime Minister Harper has recently returned from a visit to China where he assured the Chinese Government that oil sands crude oil will be readily available for export. “Canadians expect their government to uphold fundamental freedoms in their business dealings.” We need hold him to his statement. Without First Nations consent, there can be no approval of the pipeline project. The transport of Alberta crude by tanker through the Port of Kitamat has been “dis-allowed” by all 9 of the Coastal First Nations who need to give consent to the project first before it can go ahead. The declaration to not allow the tanker traffic through their lands has been ratified 100% by all Coastal First Nations involved. Both Mr. Harper and Ms Clark are denying that this UN Declaration has any bearing on the Northern Gateway Pipeline Project. More Panda Politics. So much for fundamental freedoms. What are Mr. Harper’s principles? Mr. Harper is trying to paint all opposition to the pipeline project in a bad light. Committed to ensuring the pipeline project will go through? The Pipeline Joint Review Panel is still sitting and hasn’t released any findings yet. Is Mr. Harper going to resort to more Panda Politics and will disregard the findings if not favorable. If an oyster bed is contaminated it takes 10-20 years to come back. If a clam bed is contaminated it will never come back. “significant spill can’t be eliminated”. Enbridge says it will put in place 3 stations on the route with equipment to contain the spread of the spill. Really!! The tidal flow in the area runs at about 3 knots. It would take at minimum 4 hours to have a containment boom in place. In 4 hours the spill will have spread up to 15 kilometers down channel. What’s more, the tanker leak will happen up to 30 meters below the surface and the currents will carry the heavy crude oil below the surface. Containment booms will be virtuously useless. The BC Government and the Premier of BC have an obligation to act accordingly on the First Nations behalf under the Coastal Reconciliation Protocol signed Dec. 10, 2009. Unless the BC Government and Premier Christy Clark abandon this Protocol, they are committed to act on behalf of the Coastal First Nations who are also signatories of this protocol. In respect to First Nations Rights and Law, in respect of the BC Governments obligation to First Nations people, and to uphold the Laws of Canada, our Prime Minister, the Government of Canada, the Government of British Columbia and the Government of Alberta must abandon their position that the Pipeline is “Beneficial for Canada” and put an end to Enbridge pipeline and export ambitions via the Gateway project. Stop the Gateway Pipeline which will bring Mega Tankers to the BC coast. Oil spills are inevitable. Help Elizabeth May put a stop to the Northern Gateway Pipeline. Download this petition, and have as many people as possible to sign it, and mail it – postage free – to either her Ottawa or Sidney offices. With as few as 25 signatures, Elizabeth can present your petition to the government in the House of Commons. 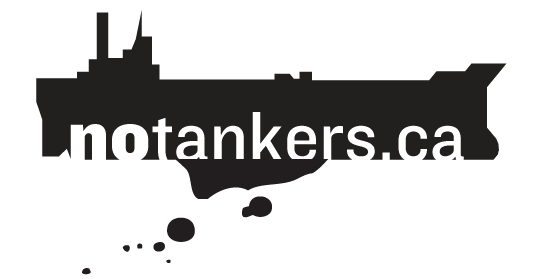 The most effective thing you can do right now would be to share the no tankers petition. The more people who sign the petition the better able we are to exercise the power of organized people to take strategic actions together. We the signatories draw your attention to proposals by Enbridge, Kinder Morgan and CN Rail to expand oil supertanker traffic through B.C.’s coast to ship oil to Asia, which would put B.C.’s abundant salmon rivers and coast at risk of oil spills. A single Exxon Valdez-like spill could jeopardize thousands of families and livelihoods, entire cultures, and a spectacular diversity of life. That’s why 70 First Nation communities banned these types of projects via the Coastal First Nations and Save the Fraser declarations, which an array of citizens are recognizing as an opportunity to unite in protection of our shared coast and advance reconciliation between First Nations and the rest of B.C. and Canada. Your petitioners recognize these declarations and the authority exercised therein, and call upon Parliament and the Legislature to use whatever means are available to stop the expansion of oil supertanker traffic through B.C.’s coastal waters.